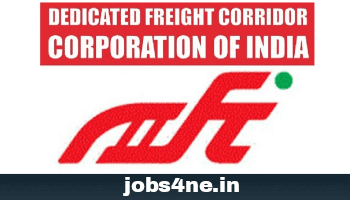 Dedicated Freight Corridor Corporation of India (DFCCIL) Recruitment 2018: Apply Online for 1572 Nos. - Jobs4NE : Jobs in Assam and North East India. Dedicated Freight Corridor Corporation of India (DFCCIL) Recruitment 2018: Apply Online for 1572 Nos. Dedicated Freight Corridor Corporation of India (DFCCIL), is a schedule 'A' Public Sector Undertaking under the administrative control of Government of India (Ministry of Railways), invites applications for recruitment through ON-LINE MODE to the· posts of Executives, Jr. Executives (Technicians), and Multi-Tasking Staff (MTS) in various disciplines, as per the details given below. Total no of posts: 1572 Nos. (Executives- 327, Junior Executives- 349, Multi Tasking Staff- 896). Executive/ Signal and Telecommunication- 97 Nos. Executive/ Operating (Station Master & Controller)- 109 Nos. Junior Executive (Grade-III)/ Civil (Artisan): 239 Nos. Junior Executive (Grade-III) / Electrical- 68 Nos. Junior Executive (Grade-III)/ Signal and Telecommunication- 42 Nos. MTS (Grade-IV)/ Civil (Track man): 451Nos. MTS (Grade-IV)/ Electrical (Helper): 37 Nos. MTS (Grade-IV)/ S&T (Helper): 06 Nos. MTS (Grade- IV)/ Operating: 402 Nos. Age Limit: 18-30 years for all posts except Multi-Tasking Staff for whom age limit is 18 – 33 years (as on 01st July, 2018). The upper age-limit is relaxable as per Govt. of India orders issued from time to time. Executive: Rs. 12,600 – 32,500/- + other allowances as admissible. Junior Executives: Rs. 10,000 – 25,000/- + other allowances as admissible. Multi Tasking Staff: Rs. 6,000 – 12,000/- + other allowances as admissible. How to Apply: Candidates are required to apply On-line through DFCCIL website www.dfccil.gov.in in English only. No other means/ mode of submission of applications will be accepted under any circumstances. Candidates should have a valid personal e-mail ID and Mobile number. It should be kept active during the currency of this recruitment process. Registration number, password, admit card for Computer Based Test, call letter for document verification or any other important communication will be sent on the same registered e-mail ID of candidate (also check email in spam/junk box). The candidates are, therefore, requested to check regularly their e-mail for any communication from DFCCIL. Please note that the Admit Card for Computer Based Test (CBT) will not be sent by post.